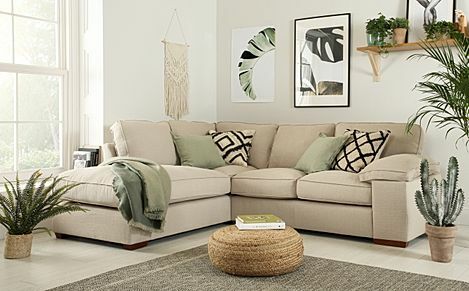 Calm, contemporary and understated – a beige corner sofa offers roomy comfort and natural textures that adapt to any room. 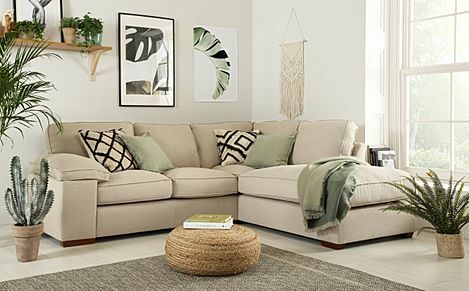 For easy-going style and family-sized space, our neutral beige corners are easy to decorate around and double down on comfort. Furniture Choice has plenty of corner sofas to choose from, and with fast and free delivery to most addresses in the UK, your new corner sofa will be in your home in no time. Corner sofas are designed to offer the same seating capacity of a traditional sofa arrangement, while freeing up floor space at one go. Choose from a selection of versatile colours, like cream and ivory corner sofas, classic designs in grey, to bold corner sofas in black. For a more customised solution, check out our L-shaped sofas to find the best shape and angle for your living room. We also have comfy sofa beds that seamlessly transform into a sleeping spot for overnight guests. Ordering with us is simple - once you've chosen your sofa, choose a payment method of your choice before selecting a delivery date at checkout.